Bits! 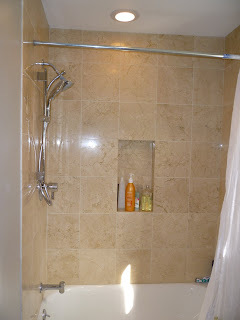 : The shower is DONE!!! 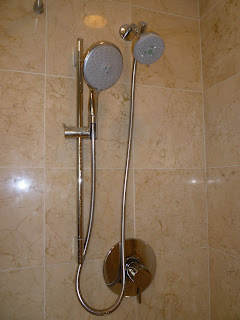 I don't think I have been this excited about a shower since.....ever! It looks so good! Limber (our building maintenance guy) is my new hero! Check out the very cool hand shower on the adjustable bar - so European! 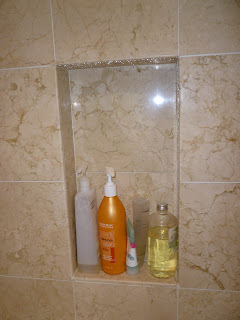 And our awesome shampoo shelf! No more stupid, rusty, chrome, shelfy thing in the corner! woo hoo! He also patched the walls in the bathroom - including the little patch behind the toilet that we couldn't reach but that we knew was wide open back there! He also put the trim around the window & the bathroom door that has been missing since we tore our place apart 2.5 years ago. It's finally coming together. Oh! And we got a real bed frame from Ikea. it's only 6" high, but what a difference! AND so much storage under there! Just need a low something under the window for the rest, and some sliding doors & voila'! We will be DONE with this place! woo hoo! Oooo...I like! Such a good feeling, getting projects done.